Collagen is a vital protein that is necessary for the health and elasticity of our skin. When collagen is damaged, skin can sag or wrinkle. This is a major reason why skin ages. Collagen damage is caused by sun exposure, smoking, high sugar intake, some autoimmune diseases, and age. Some of these factors are controllable and some are not. Limiting exposure to the sun, cutting back on sweets, and not smoking will all help with the problem. However, what is one to do against aging? That is where Image Skincare comes in. We have an extensive list of products formulated to help repair collagen damage and keep you looking ageless. 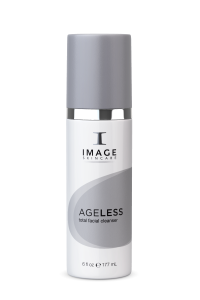 Our Ageless line is specially formulated to produce younger looking skin. It does this by utilizing AHA blends, nutripeptides, retinols, lightening agents and anti-oxidants. If you have photo-damaged, dull, pigmented or tired looking skin, this line will rejuvenate your skin and protect against environmental exposures that tend to cause this damage. The products in this line include an Ageless total facial cleanser that removes dead skin cells and helps to tone new skin. The total anti-aging serum with Vectorize-Technology™ combats aging effects on the skin and protects against oxidative stress. If you are looking for a crème that reduces wrinkles and firms the skin, Ageless total repair crème is the right choice for you. Ageless total retinol-A crème is perfect for those with aging and acne prone skin. If you are looking for a masque that lightens, brightens, smooths, and rejuvenates the skin, our Ageless total resurfacing masque does all that with the use of alpha hydroxy acids. Last, but certainly not least, the Ageless total pure hyaluronic filler is designed to increase moisture, plump and smooth the skin. If you are looking for a line of products to fight aging skin, this is certainly the collection to try. Another collagen repair line of ours is the MAXTM. This collection repairs cellular damage and adds support to the skin’s natural defense mechanisms. It uses plant-derived stem cell technology and nutripeptides to fight aging and naturally plump the skin. It is the perfect balance of correction, prevention, and nutrition. The MAXTM stem cell crème with Vectorize-Technology™ works to repair cell damage, protect against free radical damage, provide nutrition, and promote natural skin defense mechanisms. It also relaxes facial expressions to reduce wrinkles. The MAXTM stem cell masque with Vectorize-Technology restores youthful radiance by rejuvenating, regenerating, and revitalizing dull and aging skin. All of IMAGE’s eye crèmes now contain plant-derived stem cells. That means, no matter which eye crème you choose, you know it will be working to keep your eyes bright and youthful. The Ageless total eye lift crème reduces the appearance of fine lines, tightens the skin, and rejuvenates. The MAXTM stem cell eye crème with Vectorize-Technology™ protects skin stem cells while eliminating puffiness, dark circles, and reducing inflammation. It also diminishes fine lines and wrinkles. Iluma intense brightening eye crème lightens the area around the eyes, protects against aging, and relaxes crow’s feet. All the products listed above are perfect for those who are showing signs of aging due to collagen damage. If you are interested in any of the products listed here, you can find an IMAGE Skincare provider near you or call us (800) 796-SKIN. We will be happy to help!